Kalo Livadi, 100m away from the beach of Kalo Livadi, maisonette 160sq.m on plot of land 2.000sq.m, independent and to the side of a small complex, built in traditional Mykonian style with pool for common use. Built in two levels. The upper level consists of a spacious open-plan kitchen/dining area and sitting group with fire place. 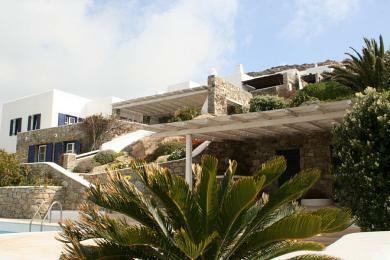 Big verandah with panoramic unobstructed and unrestricted view to the beach, the bay and the Aegean Sea. The view is the main characteristic. The lower level has 3 bedrooms and 2 bathrooms, a verandah and the same fantastic view.